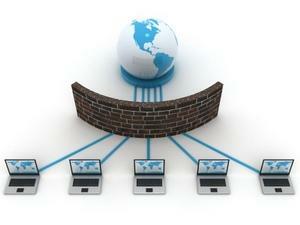 A Facebook firewall may be keeping you away from your favorite social networking site. A proxy site can help you get around a firewall, but before you head for your favorite proxy, take a moment to consider the reasons why your school or place of work may have installed the firewall in the first place. Focus on academics - When a class goes to the library or computer lab, the teacher intends for students to spend that period hard at work on research and composition. Teachers can't keep an eye on every computer screen at every moment, and a firewall that blocks inappropriate and potentially time-wasting sites is an essential tool for keeping students on task. Protect students - Schools are concerned about students making contact with adults hoping to lure in young victims, and don't want to encourage these contacts on school grounds. However, Internet predators aren't the only potential problem that students face when they go online. Cyber bullying is another major concern. Students who might not say anything mean to a classmate's face become much more bold when they go online. This cruelty often plays out on social networking sites. Improve productivity - Facebook use can quickly lead to lost productivity as workers spend their time reading status updates, searching for new friends and leaving messages. These are only examples of the basic functionality of the site. Add in the numerous Facebook applications that are available, many of which are games, and you have the potential for untold hours of distraction. Users may think that they're only going to add a funny Facebook status on their profile, but after they've logged in, it's all too easy to spend more time browsing the site than they even realize. Keep company secrets - Some companies are concerned that networked employees may be more likely to divulge company secrets, often unintentionally. For instance, the average friends list consists of a mix of work associates, online acquaintances, close friends, family members, college buddies and people who attended the same high school. If you leave the quarterly meeting and post a reference to the company's declining profits, you may be surprised how many eyes will see that information that shouldn't be privy to it. Avoid viruses - Although they are safe overall, social networking sites can make members more vulnerable to virus attacks. For instance, in late 2008, the Koobface virus hit Facebook users by sending messages that were purportedly from friends. These messages provided a link to an embarrassing video, but when users visited the link they were told that they needed to update their video player. Instead of a Flash update, however, the victims downloaded a virus. Save system resources - At a school or library, the Facebook firewall restriction may simply be a matter of allowing more time for others who need the computers for schoolwork, rather than socializing. Larger networks may include firewalls to prevent workers from using excessive bandwidth while playing games, watching videos or even unnecessarily browsing the web. However, users should note that the owners of proxies can access any information that you submit through their servers. For this reason, it is unwise to actually log in to a password-protected site while using a proxy. You never know who may be able to gain access to your account. In the end, perhaps the best solution is to save your Facebook use for after hours, or take advantage of cell phone web browsing capabilities during authorized breaks. The wide world of social networking will still be waiting for you after you finish your report.